WE BUY STEINWAYS FOR INSTANT CASH! SELL US YOUR PIANOS! WE BUY STEINWAYS FOR INSTANT CASH! SELL US YOUR STEINWAYS! SELL US YOUR PIANOS! Call Sonny (631) 475- 8046 at Sonny’s Piano of Long Island, NY !!! Call or email us today! We buy Steinway pianos of all ages, any condition, in particular newer Steinways made after 1970. Call today and speak with Sonny to get a free appraisal and discuss what options are available to you. We are here to help you find a new home for your piano! We currently have clients looking for the following pianos. 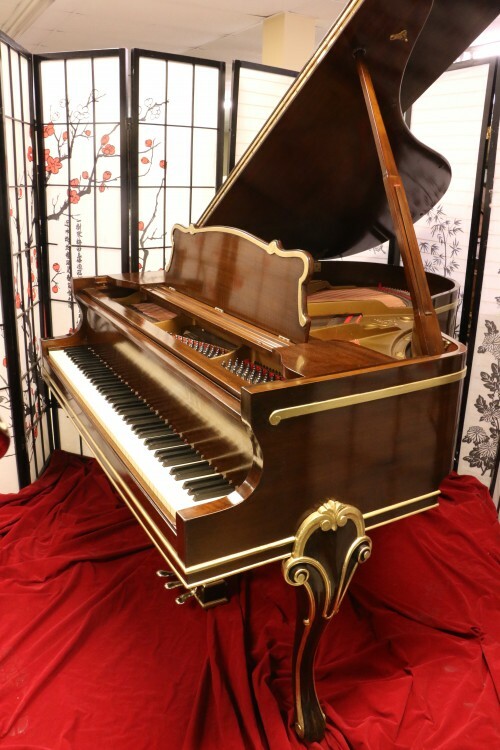 Sohmer Art Case Baby Grand Piano Refinished/Reblt Gold Trim $5900. #871: Sohmer Art Case Baby Grand Piano Refinished/Reblt Gold Trim $5900. Beautiful, Stunning, Hand Painted Art Case, mahogany Sohmer Grand 5’1″. Recently Rebuilt & Refinished with Hand Painted Gold Trim and accents. Sohmer Pianos are called “The Poor Man’s Steinway” as it is favorably compared to the Steinway piano but at a much lower price and legend has it that Sohmer & Steinway were friends and had their factories down the street from each other in Queens NYC and they shared many of their piano manufacturing secrets. This Sohmer Baby Grand Piano at 5’1″ has a great rich tone and it sounds very similar to the Steinway S 5’1″ Baby Grand Piano. When recently rebuilt they put on new strings, pins, dampers, hammers, repainted the plate, re-varnished the sound board. Everything is in excellent condition. A fine mix of Art and music. Worldwide shipping! Call for price quotes. Questions? Call or e-mail Sonny at +1-631-475-8046 or sonny@sonnyspianos.com We Install PianoDisc IQ Player Systems!